Tag Archives for " Scott Stern "
It’s guest post day here at Duct Tape Marketing, and today’s guest post is from Duct Tape Marketing Consultant Network Member Scott Stern. Enjoy! If you’re a regular reader of this blog, you’re probably familiar with John’s Marketing Hourglass. You’re probably not familiar, however, with the CIA’s Agent Recruitment Cycle (ARC). Well, as a former CIA officer-turned-marketer, I can tell you that the Hourglass and the ARC describe a similar process—with surprisingly similar goals—and are effective for similar reasons. The structural similarities between the two are interesting and you can read more about that here, but what’s more important is why they work and how you can use that understanding in your business. The most relevant concept here is one called RASCLS. I first encountered the idea in a CIA training course and, briefly, it describes the six universal principles of influence and persuasion (according to Dr. Robert Cialdini). 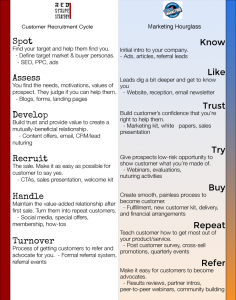 Each of these can be applied throughout the Marketing Hourglass to help guide your offerings and content. Reciprocation – Simply, people feel an obligation to reciprocate in kind when someone gives them something. Case officers are trained to always provide amenities, like tea or food, to an agent since it unconsciously triggers in an agent the drive to supply something in return. This is also why the “try” phase of the Hourglass works and is so important. Your provision of something at little or no cost to your customer creates an immediate bond and engenders a sense that they need to provide something in return. Authority – People naturally respond to authority figures. Case officers are trained to be confident in their tradecraft and knowledge and to subtly emphasize their position of authority in comparison to the asset. You shouldn’t try to emphasize your authority over a customer, but do take the time to establish yourself as an authority in your industry or on whatever it is you’re selling. Scarcity – Not even spies can escape the laws of supply and demand. Case officers emphasize use this to their advantage to both force their developmental assets to agree to recruitment (by implying it’s a limited time offer) or to get better and deeper information by implying some kind of “pressure from Washington.” Try to add a sense of immediacy to any call to action or sales message. This is as simple as changing a download button from reading “Download” to “Download Today.” Just don’t overdo it. Commitment and Consistency – There’s the idea out there that CIA officers use and discard assets and show no regard to their safety. This actually isn’t the case at all. We’ve learned that by showing assets our deep commitment to them and their safety and then being consistent in our actions on that commitment, we earn their trust and loyalty and they are more driven to work for us. The same is true for your relationship with your customers. A consistent commitment to quality products and service will create better customers. Liking – I was once in a training course on recruitment for non-case officers. We were taught to work hard to find something that we shared in common with the developmental, a shared like of a type of book, music, whatever. And if you couldn’t find something, you just made it up. You shouldn’t go that far with your customers, but you do want to try to get them to genuinely like you. People are far more likely to do things with and for people they like. Use that. Social Proof – This is a tough one in intel, but an easy one in business. Case officers most traditionally use this by implying information from other sources as a way to get their asset to admit or divulge something they may be holding back. Alternatively, it’s something a case officer must keep in mind as something they have to overcome to successfully recruit the asset – no social system in the world looks kindly on those who commit espionage. In a business, your social proofs are your referrals, testimonials, or other public demonstration that others know, like, trust, and buy from you. Scott Stern founded Red Stripe Strategy, a small business marketing consulting agency in Chicago, after eight years as an analyst and targeter at the CIA. He applies the skills developed there to help companies develop and implement marketing strategies that speak directly to their ideal customers. Red Stripe Strategy is an inbound marketing certified HubSpot partner agency. Check out our website to schedule a free consultation and get your free Small Business Marketing Quick Start Kit. Or just come say hi on LinkedIn, Twitter, or Facebook.